Serial killer novels are numerous and can feel sterotypical. How original was the premise of a serial killer targeting Susans and killing one each year? Because name origination becomes part of the plot, do you think the story would have been entirely different if the book had been MURDERING MARY instead of STALKING SUSAN? Are any of you named Susan? 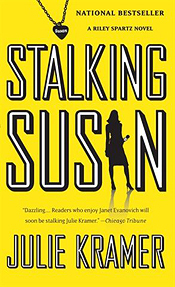 With references to famous Susans and song lyrics, did reading this book make you feel special, or creeped out? Did those of you not named Susan feel any chills? Does learning Riley Spartz is a widow change how you feel about her? What do you think of how the author unveiled that part of her backstory? Would you feel differently if the book had been written in third person rather than first person? At what places in the story did you find yourself rooting for her? At the time the Susans were murdered, the cases didn't get a lot of media attention. Why do you think that was? In real life, could you ever envision a mayor or police chief trying to keep quiet news of a possible serial killer? Do you think every murder deserves to lead a newscast or be on the front page? Do you find some murders more interesting than others? Does understanding how decisions are made in a newsroom make you distrust reporters or sympathize with them? Does knowing what's at stake in the ratings game make you feel differently as a TV news viewer? Did the author's use of scripting copy in teleprompter style make the story more interesting or was it distracting to you as a reader? One of the story's underlying themes is how grief changes peoplefrom the heroine to the villain. Discuss grief in relation to Riley Spartz, the families of the dead Susans, and Dr. Brent Redding. How does the loss of each of their loved ones affect their motivations and actions? Have any of you known bosses like news director Noreen Banks? Did you find yourself wishing Noreen would die? What did you think about Mike Flagg and competition within a newsroom? The novel incorporates several subplots, one involving a pet cremation scam. In real life, do readers and viewers sometimes care more about animals than people? Why? Dusty Foster introduces the possiblity that an innocent man had been wrongly convicted. Were you surprised when Dusty turned out guilty as charged? In real life, how often do you think prison inmates serve time for murders they didn't commit? Having so many characters with the same nameSusancan make a story complicated. How successful was the author in keeping each victim distinctive? What techniques did she use? Is there anything you think would have been helpful to you as a reader? How did you feel when Nick Garnett became the prime suspect in the Susan killings? Riley's relationship with him is problematic because she is a journalist and he is her source. What would you like their future to be? What did you think of the author's use of movie lines as part of their shtick? How did the author keep the Reporter With Cop Sidekick from becoming cliché? How about the final confrontation, sometimes known as The Talking Killer scene? Did you feel any pity toward Dr. Redding? What did you think of the use of an epilogue to tell readers what happened to the characters after the action wraps? How necessary to the story was the scene in which Riley reads the letter from Hugh?